Donny has loved his friend Greg for years but never told him. They shared one brief night together before Greg married Megan and Donny … well, Donny tried to move on. He thinks he’s succeeded in relegating Greg to the past until he receives a postcard from his friend that suggests Greg still thinks of that night, too. The postcard is waiting for me when I get home from work. It’s tucked in with a few bills, a letter from my mom, and an ad from Wal-Mart that I just toss away. The letter I put aside, and I shuffle through the bills, disinterested. Then I see it. A glossy beach at sunset, a couple holding hands, walking along the surf. Love in L.A., it reads in a flourish script across the orange sun. I don’t know anyone in Los Angeles. 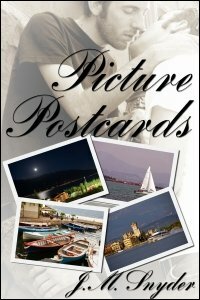 I turn the postcard over, and my heart freezes at the tight black words scrawled on the other side. I miss you. Everything about you. About us. I hate living this lie. My address in the block letters I remember so well. A smudged thumbprint beneath the stamp. The cryptic message -- I miss you -- and nothing else. No return address. Nothing to tell me who it’s from. As if I didn’t know. My throat closes as I read the message again. I miss you. Jesus, I think. I miss you, too, Greg. Where the hell are you now?